Pest control is a process for regulation and management of different living organisms that are harmful for human population. Pests such as termites, bedbugs, cockroaches, certain reptiles and other unwanted organisms affect day-to-day life and hinder human activity by interfering in agricultural, residential, commercial and industrial processes. Pest control management is carried out to eliminate pests and ensure hygiene and healthy lifestyle. Pest control management can be done with the help of various techniques, such as chemical control, mechanical control, and other pest control. The global pest control services market has been estimated to be valued at US$ 16,007.2 Mn by 2015-end and is expected to expand at a 5.4% CAGR over the forecast period (2016–2026). 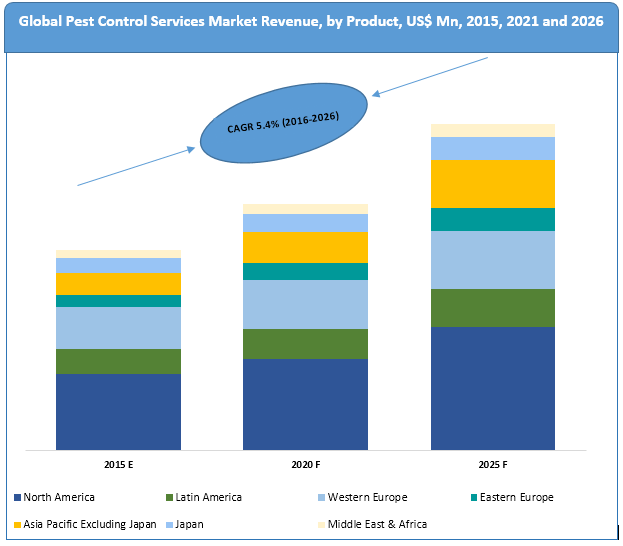 Growth of the global pest control services market is driven increasing pest population, attributed to the largely available food sources for small organisms and conducive living habitats. Besides, growing consumer awareness concerning health and hygiene in developed and developing countries is further fuelling market demand for pest control services. Other promising factors, such as easy availability of pest control service providers and increasing economic activity are also contributing to the growth of the market for pest control services. Changing global climate conditions conducive for the growth and evolution of pests, which affect human health, is projected to further boost demand for pest control services. International tourism is also an upcoming and prominent factor driving rise in demand for different types of pest control services. According to the statistics, there has been a 17.3% rise in influx of international tourists between 2010 and 2014, which is expected to increase to about 60% by the end of 2030. On the basis of application type, the market is categorised into ant control, bedbug control, beetle control, bird control, cockroaches, mosquitos & flies control, rat & rodent control, termite control and other applications such as moisture control, repellers, etc. Among these application segments, the termite control segment is expected to witness the highest growth over the forecast period. Based on service, the market is segmented into three classes, namely chemical control service, mechanical control service and others. 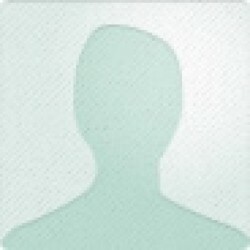 The chemical control service segment is further divided into two categories, i.e. organic chemicals and inorganic chemicals. The chemical control service segment is expected to expand at the highest CAGR over the forecast period. Based on end user, the market is segmented into four main categories, namely residential, commercial, industrial, and agriculture. According to statistics, currently, the commercial end user segment accounts for the highest market revenue, whereas the agriculture segment is expected to expand at the highest CAGR over the forecast period. In this report, the global pest control services market has been segmented into seven major regions, namely North America, Latin America, Eastern Europe, Western Europe, Asia Pacific Excluding Japan (APEJ), Japan and the Middle East & Africa (MEA). In terms of value, the North America market accounts for the maximum revenue share of the overall market followed by Western Europe. The North America Pest Control Services market is expected to expand at a CAGR of about 5.0%, and dominate the market in terms of value during the forecast period. Meanwhile, the APEJ market is expected to expand at the highest CAGR of above 6.0%, due to the increasing demand for maintaining better hygiene standards and high health care expenditure in the region. The APEJ market is very closely followed by the Latin America and the MEA market. The Western Europe market is expected to expand at a slow growth rate, followed by the Japan market. Among all the regions, the Eastern Europe market is expected to expand at a moderate CAGR of 5.7% over the forecast period. Some of the major players in the global pest control services market covered in this report are Ecolab, Inc., Rollins, Inc., Rentokil Initial Plc., Service Master Global Holdings, Inc. (Terminix), Massey Services Inc., Arrow Exterminators Inc., Sanix Incorporated, Asante Inc. and Dodson Brothers Exterminating Company Incorporated. The report also describes company-specific strategies related to key developments and market consolidation initiatives by key players.